This Scale Aircraft Conversions set for the Wingnut Wings 1/32 Halberstadt CL.II. 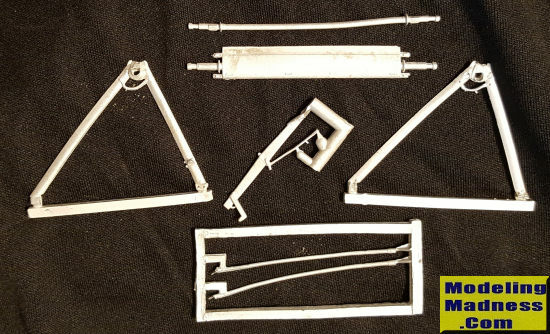 Typical of WWI types, the set provides the two main landing gear legs along with a tail skid. This set provides a pair of axles, one includes a center 'wing' style spreader bar and the other is plain. There are also two other struts included and I have no idea where those fit. Note that it is not unusual for long, skinny pieces in metal sets to need some straightening. It is a simple task that, as in this case, can often be accomplished by rolling the part on a hard surface. These are direct replacements for the kit parts and are nicely molded.